Travel demand management is very often implemented at the local level, especially as it relates to site-level programs (employment sites, new developments, sporting venues). Local planning is generally associated with municipal governments, (i.e., city planning activities), but sometimes TDM is planned at a local level outside the institutional framework of city government (e.g., TMAs or sub-regional planning activities). Municipalities play a very important part in TDM planning, because they are often the key actors in program implementation. For example, municipal land use and parking policies are very important mechanisms for influencing demand. As corridor-level transportation management strategies are developed, effects on parallel arterials and city streets are vital considerations. Finally, the implementation of some specific TDM strategies, such as bicycle and walk infrastructure, transit signal prioritization, carsharing, and parking management, are within the purview, plans, and budgets of municipalities. Some of the most successful TDM programs are planned and implemented in high-growth cities. The negotiating leverage of these cities to mitigate the traffic impacts of this growth via TDM is key. Finally, some of the most innovative demand management strategies have been implemented by cities, namely cordon pricing (London and Stockholm), demand-based parking pricing (Redwood City, CA), growth management (Portland, OR), and pedestrian/bicycle prioritization (New York City). What is the appropriate role for municipalities in integrating TDM into the planning process? Use a site plan review process to incorporate TDM into new developments. Participate in regional committees and planning efforts that include TDM. Build upon control of cities over parking management as a TDM measure. Focus on community-level planning for bike and walk initiative tied to livability. Cities are the focus of sustainable transportation and climate change action plans. 8.1	What Plans Should TDM be Included In? The integration of TDM into local planning practices can occur as part of a wide variety of local planning activities, as enumerated in Table 8.1. Include recommendations on TDM in the circulation element of the general plan as a strategy to make local arterials operate more efficiently. Include TDM as a complement to parking management activities. Include TDM mitigation requirements for new developments when outlining land use and zoning policies. Codify the role of TDM in the site plan review process via trip reduction ordinances or more informal, negotiated processes. Elicit TDM planning under the auspices of localized TDM implementing agents, such as Transportation Management Associations (TMAs) or Transportation Management Districts (TMDs). Develop citywide TDM plans to focus the TDM-specific activities of the municipality. May include a description of current city activities, how these fit into state and regional plans and efforts, and a set of specific implementation objectives for the next several years. Develop action plans to address climate change, since the reduction of car use is often a key strategy in climate action plans, TDM often plays a central role. Include ways that cities and citizenry can operate greener and cleaner (low energy solutions, clean municipal fleets). Make TDM the centerpiece by developing transportation solutions that are grounded in sustainability. Plan places travel choices, environmental mitigation, and social inclusion as the top of the plan's goals and objectives. Elevate the importance of TDM to a stand-alone planning activity in order to coordinate all related activities at the municipal level. Municipal TDM plans should seek to go beyond traditional TDM (often the focus of site-level mitigation strategies) to include the broad spectrum of travel demand influencing efforts, including parking pricing, neighborhood marketing, special event planning, cordon pricing, preferential treatments on arterials. TDM is often used as a mitigation strategy to minimize the impacts of new traffic generated by new or expanded development. Many cities have codified the role of TDM in the site plan review process via trip reduction ordinances or more informal, negotiated processes. Some cities have codified the review process into a Transportation Management Plan requirement for new, major trip generators (e.g., San Francisco, Seattle). Trip reduction requirements are often supported by regional plans and policies that promote good practice and model ordinances. Major development areas sometimes prompt a specific plan for a planned unit development or major employment center. To ensure that integrated strategies are developed for the entire area, these plans often include a comprehensive TDM element to mitigate traffic impacts and "build" TDM into the travel choices for future tenants and visitors. 8.2	What Is Your Capability with TDM at the Local Planning Level? Performance measures include fully developed TDM local-level "outcomes"
Municipalities and local agencies with minimal experience in integrating TDM (ad hoc level) into their plans and policies might only be viewing TDM as a mitigation strategy for addressing the impact of traffic generated by new development. Moving to the next level (defined), a city might include TDM in most plans and policies as a means to increase travel choices and meet certain policy objectives, such as circulation or livability. In this case, TDM is likely one element of the overall general plan. Finally, when TDM becomes optimized (Level 3), TDM may become a central focus of sustainability or climate change plans if the city council adopts an overall "philosophy" of managing demand and encouraging sustainable transport. Table 8-2 provides specific examples of how localities might work to integrate demand management into regional transportation planning efforts. This matrix is intended to assist the reader in determining where his or her organization fits in terms of the capability levels described above. Once the reader has determined his/her agency's capability level and identified the critical step on which the agency is focused, specific actions to move from one level to the next are suggested in the next section. In general, TDM is being integrated into existing plans and planning processes. TDM is often mentioned in General Plans or Comprehensive Plans for cities as part their routine updating process. This is where the relationship between land use, parking, and TDM can be defined and exploited. As such, no new or specialized planning process needs to be developed. However, in the case of stand-alone TDM or climate action plans, a process may need to be established for the review and approval of the new plan. This may even require the appointment of new committees and advisory bodies. Some plans are developed through unique public/private partnerships, such as the plans directing the activities of TMAs or the development of a Transportation Management Plan for major developments or trip generators (e.g., hospitals, special event venues, stadia, etc.). It is also important that municipal TDM planning efforts be coordinated with regional or corridor-level TDM planning. Municipal programs (e.g., parking) and policies (e.g., site review) can be very important aspects of broader TDM strategies at the corridor or metropolitan level. Cities with active TDM policies and plans can encourage neighboring cities within their region to integrate TDM into their plans. Municipal efforts to manage demand can also be important mechanisms for realizing objectives with other metropolitan area plans, such as the Congestion Management Process. Several specific actions can be suggested to move an agency's local planning process from Level 1 (ad hoc integration of demand management) to Level 2 (defined integration). For each action, the rationale, an explanation, and examples are provided where available. Table 8.3 indicates the relative ease or difficulty of implementing each action. City staff, including: traffic, streets and/or transportation staff, planning and development review staff, city council staff, city manager, and specialized departments, such as parking, transit, or environment. Transportation service operators, including: all transit service providers operating within the city, shuttle services, vanpool operators, carsharing companies, bike stations, etc. Developers, including their planning contractors and on-site tenant services providers. Employers, including those fulfilling trip reduction mandates, those at sites subject to traffic mitigation as well as other large and enlightened employers (including the city as an employer). Business organizations, such as: chambers of commerce, business and industry councils, and TMAs. Advocacy groups, including environmental groups, bicycle and walking advocates, and transit user groups. Commute management organizations – providers of ridesharing and other TDM services, sometimes housed and/or funded by regional planning organizations but sometimes housed within municipal governments. Owners and operators of other transportation facilities (e.g., transit stations, freight operators). Rationale and Explanation – TDM may be a rather foreign concept to those involved in local decision-making, given a traditional focus on streets and intersections. It will be important to educate decision-makers about the benefits of supporting and implementing TDM as a means to address specific local transportation and quality of life objectives. Example – Many local planning and municipal organizations offer training and technical assistance on various initiatives, such as TDM. For example, the League of California Cities offers sessions on TDM planning as part of its various conferences and workshops. Rationale and Explanation – As with many transportation-related policies, objective setting often results in rather vague targets. In TDM, appropriate objectives might be to: offer more travel choices, reduce congestion, improve air quality, or assist commuters. Using a SMART objective setting process, TDM goals and objectives should be as precise as possible. This requires a more involved planning process to reach consensus, especially with regards to measurable targets, but it allows for a more robust planning and evaluation process that allows for better monitoring of objective attainment, strategy correction, and funding decision-making. Example – The Washington State 2006 CTR Efficiency Act continued a state mandate that goes back to 1991. Cities and counties are able to set their own specific goals and targets for employee commute trip reduction, as long as they met the minimum state targets of a 10% reduction in single occupant commute trips by 2011 to address congestion and a 13% reduction in VMT to address GHG emissions. In the first three years of the program, 154 million VMT have been reduced at over 1,000 worksites, representing over a half a million commuters. This is estimated to have reduced highway delay by 8% in the Central Puget Sound region and almost 70,000 metric tons of GHG statewide. While the state legislation behind the CTR Efficiency Act was a major policy effort, the need for and ability to set quantifiable targets was fairly straightforward. Rationale and Explanation – Many of the local initiatives to promote travel choices focus on concepts such as transit-oriented development, smart growth, and complete streets, designed to make transit use, bicycling, and walking more attractive to reduce VMT. However, most of these initiatives are oriented toward land use policies and design. TDM can be integrated into these initiatives in order to promote the use of these sustainable modes and provide incentives to use them. Example – Planning for transit improvements and transit-oriented development in the Dulles Corridor (Virginia/DC) includes aggressive employer-based TDM, parking management, and trip reduction requirements for new large-scale commercial developments. Rationale and Explanation – Many of the precepts included in the regional TDM planning process, in terms of the objectives-driven, performance-based approach to transportation planning, apply at the municipal level as well.142 For example, the need to be outcome-based is very important to TDM. Many TDM efforts are judged on outputs (what services were delivered, what information was provided?) rather than on outcomes (did residents change travel behavior resulting in a measurable reduction in VMT?). Even so, some of the specific objectives within this recommended approach cite the number of local communities who will plan and implement key demand management strategies (e.g., shared parking policies) and look to city staff as a source of performance data. Example – The NYSDOT has developed new guidance for local TDM programs to develop outcome-based performance measures and related program objectives therein. Rationale and Explanation – TDM analysis can often be very piecemeal and based on anecdotal evidence, rules of thumb, and sketch planning techniques, at best. However, several tools are available to assist with the evaluation of TDM strategies as part of the planning, alternatives analysis, and project selection process. Utilizing these tools largely requires the time and commitment to learn about the use of the tools in advance of the planning process. Example – Chapter 9 includes a description of several existing tools aimed at allowing for the quantification of TDM impacts for various strategies and packages of strategies. This includes the FHWA TDM Evaluation Model and the TRIMMS available from the CUTR (see more discussion in Section 9 on Tools and Techniques for Evaluating TDM). Rationale and Explanation – TDM is widely viewed as most effective at the site-specific level. However, for TDM to be accepted as a means to address a broad set of objectives, the impacts of TDM on subareas, corridors, and city-wide need to be assessed. This can be accomplished by either aggregating site-specific (e.g., employer or developer) impacts or measuring effectiveness on a broader level (such as resident travel surveys, etc.). Example – The Washington State CTR law requires worksites in urbanized counties to reduce vehicle trips and VMT. Standardized surveys, data collection, and analysis allow CTR results to be reported by city and county. Rationale and Explanation – Beginning in the 1980s, many growing suburban cities enacted regulations that sought to mitigate the impact of new development on localized traffic. These ordinances directed planners to review site development plans with the intent of requiring TDM measures at new developments in order to mitigate vehicle trip generation. Many of these mandates are still in force, but a lack of staff continuity, changing conditions, and inconsistent or weak enforcement have minimized the lasting impact of these requirements. Cities could update their TDM ordinances in order to maximize effectiveness and applicability. Example – Several cities have recently updated their TDM ordinances, including Pasadena, California, and Fairfax, Virginia. In both cases, TDM requirements were modified to reflect empirical evidence on effectiveness of various TDM strategies and enhanced reporting and enforcement. Rationale and Explanation – Cities can assist with TDM implementation by establishing a TDM fund that could pay for innovative strategies and pilot studies, and serve as matching funds for private funds. In some cases, these funds can be supported by local sales tax initiatives and developer impact fees. In addition, cities are in a good position to expand the set of travel choices available to residents, workers, and visitors. This is especially true of "last mile" solutions to get commuters to and from their destinations. This might include: bike paths, connected sidewalks, shuttle services, telework assistance, etc. Example – The City of Rockville, Maryland, maintains a TDM fund that generates about $200,000 per year, from a transportation improvement fee levied on new development. The fund supports activities included in the city's transportation demand management plan.143 Many cities have assisted with or provided carsharing services, such as CityCarShare in Berkeley, California. Rationale and Explanation – Two areas where performance evaluation and reporting can be strengthened at the local level include self-monitoring and reporting to decision-makers. Many trip reduction requirements, on employers and developers, involve the self-reporting of program effectiveness. This can result in inaccurate, incomplete, or non-existent data being collected from the trip generators that are subject to these requirements. New methods for automated reporting of commuter behavior (see example from Redmond, Washington in section 8.5) can help avoid some of the issues with required surveying. Reporting of TDM results to city policy-makers is often lacking, or it may not be couched in terms that decision-makers can understand. Example – Many TDM programs are monitoring travel behavior change through the use of commuter calendars, completed by commuters themselves and validated by supervisors. Many of these automated calendars are used to qualify users for incentives and giveaways. Several specific actions can be suggested to move an agency's local planning process from Level 2 (defined integration of demand management) to Level 3 (optimized integration). Table 8.4 highlights the relative ease or difficulty of implementing each action in moving from Level 2 to Level 3. Rationale and Explanation – TDM has become a very common response to air quality and congestion issues and is growing in popularity as a means to address land use and freight issues. However, TDM can become much more humanized as a means to improve residents' quality of life, including livability and health. Cities that link TDM and enhanced travel choices to citizens' health and quality of life have the potential of creating a very personalized appeal for TDM. Example – Many cities cite the health benefits of walking and bicycling in their efforts to promote city- provided facilities and programs. However, a growing number of TDM programs are citing the health benefits of all sustainable modes, in terms of reduced stress and improved personal safety (lower risk of accidents). Rationale and Explanation – As mentioned earlier, many efforts to integrate land use and transportation involve design improvements, such as transit-oriented development and sidewalk continuity. However, in order to make the travel choices enhanced through these design features more effective, TDM programs can provide the soft promotional support that induces drivers to switch to these more sustainable modes. Therefore, cities could better integrate TDM into their smart growth policies to make enhanced travel options utilized to the maximum extent. Example – Land use plans and policies seek to balance the desire for growth while minimizing its negative consequences. As such, TDM is a valuable and well-used tool for reducing traffic generated by new development. While some TDM plans for new development are based on desired mode split or proportion of projected vehicle trips reduced, some (as seen in the City of Irvine, CA, example below in section 8.5) are simply based on setting a cap on trip generation and monitoring of compliance. TDM strategies included in traffic mitigation plans are often based on the known or expected impacts of various strategies, but require periodic monitoring to assess whether agreed-upon targets are met. Rationale and Explanation – Many cities have developed sustainability policies, initiatives, programs, or even departments. TDM can become a key part of this initiative by providing a means for cities to improve the environment and maintain economic competitiveness while not compromising social inclusion. Cities can form a TDM subcommittee of its sustainability initiative. In fact, when TDM becomes a cornerstone of sustainability, a key goal of TDM is to develop and implement reliable travel choices. Rationale and Explanation – TDM can be consistent with economic development goals by seeking to enhance mobility and accessibility, reduce congestion, and address air quality. If TDM is viewed as broadening travel choices, and not as strictly a means to inhibit car use, TDM can be part of a long-term strategy to make a city more attractive to development. This is in keeping with the definition of sustainable transportation discussed above. Rationale and Explanation – In terms of setting objectives and measuring performance, many of the same objectives and performance measures used in regional plans will apply to municipal TDM plans and policies, especially those related to the core metrics related to vehicle trip, VMT, emissions, and energy reduction. However, cities possess some specific areas of influence, namely parking, land use, arterial management, and bicycle/pedestrian programs that may dictate the types of objectives and performance measures included in municipal plans. Going one step further, performance measures should be developed for new objectives, such as livability, and many of these measures may be somewhat subjective (e.g., residents' perceptions about quality of life and travel choices) as well as quantitative (utilization of travel options by various disadvantaged user groups). Establishment of parking districts and targeted functioning. 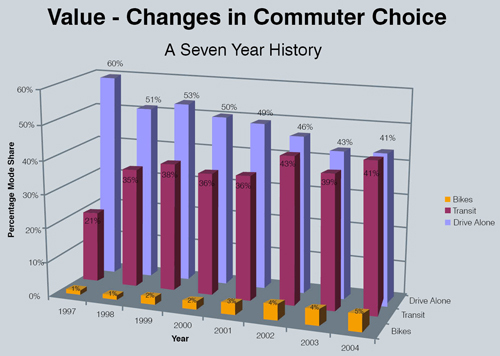 Relationship between parking and mode choice (e.g., transit use). Parking utilization (turnover, cruising, occupancy). Many of these strategies can serve to manage travel demand by discouraging car use at certain times of day, in certain areas, or overall. Parking management has been shown to influence mode shift, especially transit use. From this, specific performance measures can be established to gauge the success of parking management policies and strategies in influencing travel demand. Most parking data are observed (occupancy, turnover, etc.) and this is a good source for assessing the temporal and spatial characteristics of parking use, but in order to get at mode shift, surveys of parkers or travelers are needed to assess how and why behavior changed. Rationale and Explanation – As mentioned earlier, while TDM impacts are most often tied to very site-specific program results, the ability to assess the wider impacts of TDM will be important to its broader acceptance. Cities can assess the temporal distribution of trips reduced from employer and developer trip reduction programs on area highways and on the region as a whole. Example – Using VMT reduction, volumes and speeds, estimates of reduction in delay can be derived. Going one step further, the CUTR has developed a methodology that merges mode shift data with a highway micro-simulation model to graphically show how employer trip reduction programs can reduce delay for a given highway segment.147 This research and examples of the graphic displays are shown earlier in this document. Rationale and Explanation – Moving from the defined approach to a more optimized integration of TDM may require the development of tailored and specialized analytic tools to evaluate the effectiveness of TDM strategies in addressing key policy objectives. While many "off the shelf" tools now exist, in order to analyze the full set of TDM strategies and their impact across a myriad of objectives, specialized tools may be required. This might include new, tailored means of using the traditional four-step travel models or newer activity based models. It might also involve other new tools, such as the micro-simulation tool, developed by CUTR and discussed in earlier in this section, which uses employer TDM data and CORSIM. Example – The traditional four-step travel demand modeling process can be used to evaluate TDM strategies that can be analyzed in terms of time and cost variables. However, many off-model tools have been developed to analyze congestion pricing strategies, bicycle and walk strategies, and other strategies that cannot be expressed in terms of time and cost indicators. As mentioned above, a good discussion of the means to incorporate TDM into regional travel demand models is provided by CUTR in a report entitled "Incorporating Assumptions for TDM Impacts in a Regional Travel Demand Model." This approach, which was developed for WSDOT, includes a specific TDM Assessment Procedure that uses the CUTR TRIMMS model and processes resulting TDM impacts through standard trip tables.148 In fact, the use of the TRIMMS model itself to perform cost/benefit analysis for TDM strategies could represent a significant movement toward mainstreaming TDM integration. Rationale and Explanation – If TDM is to be part of a longer-term strategy to reduce overall vehicle demand, then programs and projects need assurances that resources will be in place to fund them. Developer impact fees can be highly variable based on economic conditions. While many TDM programs are funded out of federal CMAQ funds, these funds have a distinct time limit (3 years). However, some TDM programs, especially in California, are partially funded through county sales taxes. Example – Many counties in California have a voter-approved ½ to 1 cent sales tax dedicated to transportation. Most of these funding programs include a broad set of roadway, transit, and TDM projects. The TransNet 20-year program in San Diego provides funding for transit and bicycle facilities. Measure M in Riverside County helps pay for TDM services and incentives. Rationale and Explanation – In order to provide an effective feedback loop to the objective setting and strategy selection process, standardized TDM evaluation methodologies are required. This might involve developing a tailored approach for a given MPO or adopting a widely accepted methodology. Such methodology development or adoption should be vetted with TDM professionals and researchers to assure that it is understandable, rigorous, and usable. Example – The MAX-SUMO monitoring and evaluation approach developed in Europe is easily adaptable to the U. S. experience for many TDM strategies. The methodology is described in Section 9 and graphically depicted in Figure 9.1. Two examples of municipal or local TDM planning efforts and results are provided here: Irvine, California and Redmond, Washington. The Irvine case relates to the planning of TDM measures for new developments. The Redmond case involves the role of the city in both offering TDM services and managing demand at new or expanding developments. The Irvine Spectrum is a very large commercial and retail development in Orange County in southern California. It is a 5,000 acre business park and high-density development, which is now home to over 3,600 companies employing in excess of 65,000 people. In 1986, the Irvine Company gained final development approval by the City of Irvine following an extensive consultative process and development of a transportation management plan. Transportation management goals and use provisions were assigned to the development permit. Planning requirements and goals were established in meeting the City of Irvine's vision for successful development mitigation. Several demands were placed upon the developer including the establishment of a multi-modal transportation system including rail, bus, car- and vanpooling, and preferential parking within the development. These permit provisions established goals and requirements for land use design that considered and planned for alternative transportation modes. Additionally, the development was permitted with trip generation targets and assigned permitted future growth planning goals. A TMA, Spectrumotion, was chartered to provide ongoing management of the transportation plan for the development and its tenants. The Spectrumotion TMA is charged with implementing the planning requirements through transportation goal attainment, alternative mode promotion and program development, and follow-up surveys and evaluations. The Irvine Company is responsible for permit compliance; it raises funding through tenant assessments to pay for programs and improvements. The City of Redmond, Washington, near Seattle, has used TDM as a key strategy to address municipal policies for over 20 years. The stated mission of TDM is to "improve mobility and achieve greater efficiency on the arterial system by offering and promoting alternatives to single occupant vehicle travel." The City's TDM program is the principal means to achieve the mode split goals established in the overall city Master Plan. The city assists employers located within its boundaries to comply with the state CTR law, as well as state mandates on environmental protection and growth management. Redmond also helped found and fund the Greater Redmond TMA, which represents most of the city's large employers and developers and is now self-sufficient through membership dues. Redmond requires Transportation Management Programs of new and expanding development sites and sets targets based on parking allowances and the proportion of commuters who travel using alternative modes. These requirements also mandate specific supportive physical improvements at development sites, including preferential parking for carpools and vanpools, bicycle lockers and racks, employee showers and lockers, on-site connectivity to transit stops, and internal sidewalks and trails. One unique feature of Redmond's TDM efforts, as described in the TDM element of the Master Plan, is R-TRIP (Redmond Trip Resource and Incentive Program). R-TRIP is aimed at reducing congesting and improving air quality by offering incentives to those who agree to use commute alternatives. It is open to anyone who lives or works in Redmond and offers a one-time financial incentive (cash, bus pass, or vanpool incentives) for those who participate and then a chance at prize drawings thereafter. Commuters keep track of their daily travel on the on-line incentive calendar (www.gortrip.com) shown in Figure 8.2. Continued implementation of TDM programs as a transportation mobility tool. Development of residential TDM programs to achieve mode share goals. Development of long-term strategy for marketing TDM, especially multi-modalism. Development of a new TDM demonstration project each biennium to test and evaluate new concepts. FHWA, Advanced Metropolitan Planning for Operations: An Objectives-driven, Performance-based Approach: A Guidebook, 2011). SHRP II, Guide for Improving Capability for Systems Operation and Management, TRB, prepared by Parsons Brinkerhoff, Report S2-L06-RR-2, 2011. WSDOT, Incorporating Assumptions for TDM Impacts in a Regional Travel Demand Model, prepared by CUTR, report WA-RD-746.1, March 2010. 139 SHRP II, Guide for Improving Capability for Systems Operation and Management, TRB, prepared by Parsons Brinkerhoff, Report S2-L06-RR-2, 2011. 142 FHWA, Advanced Metropolitan Planning for Operations: An Objectives-driven, Performance-based Approach: A Guidebook, 2011. 148 WSDOT, Incorporating Assumptions for TDM Impacts in a Regional Travel Demand Model, prepared by CUTR, report WA-RD-746. 1, March 2010.